Uns Männern der Scharnhorst, trotzig und hart. 15 June 1935: Keel Laid down on Slipway 2 at the Kriegsmarinewerft shipyard in Wilhelmshaven. Construction number S 125. 03 October 1936: Launched. The pre-launch speech is delivered by the Commander-in-Chief of the Armed Forces, Generalfeldmarschall Werner von Blomberg, and the ship christened by the widow of Captain Felix Schultz, lost with the armoured cruiser Scharnhorst during World War I. 07 January 1939: Commissioned under Captain Otto Ciliax. February-March 1939: Conducts trials in the Baltic sea. 01 April 1939: Following the launching of the battleship Tirpitz in Wilhelmshaven, Erich Raeder is promoted to Grand Admiral aboard the Scharnhorst. June-August 1939: Reconstruction at Wilhelmshaven Naval Dockyard. The straight stem is removed and replaced by an Atlantic bow, the funnel is fitted with a cap. In addition the hangar is enlarged and equipped with a new catapult. The mainmast in the funnel is removed and placed 27 m. astern of the hangar. 21 September 1939: Captain Kurt Hoffmann takes over command of the Scharnhorst from Captain Ciliax. September-October 1939: Anchored at Wilhelmshaven. 17 October 1939: At Wilhelmshaven, the crew of the Scharnhorst lined up on deck, welcomes U-47 (Lieutenant Günther Prien) after its successful attack in Scapa Flow. 21 November 1939: Departs Wilhelmshaven with her sister-ship Gneisenau under the command of Vizeadmiral Wilhelm Marschall. 23 November 1939: Shortly after 1600 hours, Scharnrhost and Gneisenau engage the 16,697-ton British auxiliary cruiser Rawalpindi (Captain Edward Kennedy) that finally sinks at about 2000 hours. The Scharnhorst is hit by a 152mm projectile from the Rawalpindi but the damage is insignificant. Picks up 27 survivors. 27 November 1939: At midday arrives at Wilhelmshaven. December 1939-February 1940: The MES (Magnetischer Eigenschutz) "magnetic self-protection system" is installed, and a new FuMO 22 radar set is mounted on the foretop platform. 18-19 February 1940: Short sortie in the North Sea. 06 April 1940: Operation Weserübung. At midnight, leaves Wilhelmshaven with Gneisenau as the cover force of "Group I" for the invasion of Norway. 09 April 1940: Shortly after 0500 hours, some 50 miles off Narvik, Scharnhorst and Gneisenau under the command of Vizeadmiral Günther Lütjens, are engaged by the British battle cruiser Renown. In a brief exchange of fire the Gneisenau is hit by one 15-inch and two 4.5-inch projectiles. The Renown in turn is hit by two 28cm shells. 12 April 1940: In the evening, Scharnhorst, Gneisenau, and Admiral Hipper arrive in Wilhelmshaven. 10 May 1940: Passes through the Kiel Canal en route to Kiel. 04 June 1940: Operation Juno. At 0700 hours, leaves Kiel with Gneisenau, the heavy cruiser Admiral Hipper and the destroyers Erich Steinbrink, Hans Lody, Hermann Schoemann, and Karl Galster. 08 June 1940: At about 1600, the Scharnhorst sights the British carrier Glorious (Captain D'Oyly-Hughes) escorted by the destroyers Acasta (Comander Charles Glasfurd), and Ardent (Lieutenant Commander J. F. Barker). At 1632 opens fire from 26,000 meters (28,500 yards). Six minutes later at 1638, from 24,000 meters (26,300 yards) the Glorious is hit in the flight deck starting a fire. Gneisenau opens fire at 1642, and a few minutes later the Glorious is hit again in the bridge killing the Captain and most of the personnel there. At 1656, Scharnhorst and Gneisenau cease fire temporarily due to smoke screen launched by the escorting destroyers. Thereafter, the Ardent launches eight torpedoes but obtains no hits and is sunk by the combined fire of both German battleships at 1725. The Glorious comes again under fire, and at 1720 she is hit in the centre engine room. Meanwhile, the Acasta closes on, and at about 1730, obtains a torpedo hit on Scharnhorst's starboard side under turret "Cäsar". The torpedo tores a hole of 14x6 meters in the hull, and 2,500 tons of water get on the ship. As a consequence of this torpedo hit the after 28cm turret is put out of action, and 48 men die. Heavily damaged the Glorious capsizes and sinks at 1810. The Acasta finally sinks at 1820. In all more than 1,500 British sailors lose their lives. During this action Scharnhorst expends 212 x 28cm and 842 x 15cm shells. 09 June 1940: In the afternoon, Scharnhorst and Gneisenau arrive in Trondheim. 13 June 1940: During the course of an air raid while lying at Trondheim, the Scharnhorst is hit by a 225-kg bomb that fails to detonate. 21 June 1940: After temporary repairs in Trondheim, the Scharnhorst returns to Kiel. 23 June 1940: In the evening the Scharnhorst arrives in Kiel. 24 June - November 1940: Drydocked for repairs at Deutsche Werke, Kiel (Dock C). 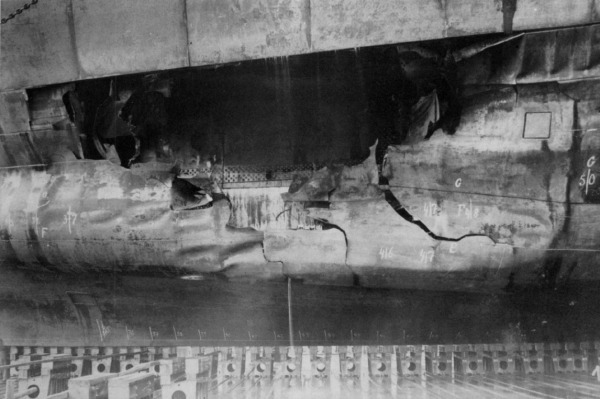 Damage caused by the torpedo that hit Scharnhorst on 8 June 1940. November - 17 December 1940: Training exercises in the Baltic. 18 December 1940: Scharnhorst and Gneisenau leave Gotenhafen for Kiel. 23 January 1941: Operation Berlin. Scharnhorst and Gneisenau, under the command of Admiral Günther Lütjens, depart Kiel for the Atlantic. 28 January 1941: Scharnhorst and Gneisenau sight the British cruiser Naiad in the Iceland-Faroe strait and turn around. 05 February 1941: Scharnhorst and Gneisenau enter the Atlantic through the Denmark Strait, and refuel from tanker Schlettstadt some 150 miles south of Cape Farewell. 08 February 1941: Sights convoy HX-106 escorted by the battleship Ramillies. Therefore Admiral Lütjens breaks contact. 14 February 1941: Scharnhorst and Gneisenau refuel from tankers Esso Hamburg and Schlettstadt. 22 February 1941: Scharnhorst and Gneisenau sink the British merchantmen Kantara (3,237 GRT), Trelawney (4,689 GRT), Huff (6,200 GRT), tanker Lustrous (6,150 GRT), and Harlesden (5,483 GRT). 27 February 1941: Scharnhorst and Gneisenau refuel from tankers Ermland and Friedrich Breme and head to the Canary Islands. 06 March 1941: Scharnhorst and Gneisenau meet with U-124 (Lieutenant Wilhelm Schulz). 07 March 1941: Scharnhorst and Gneisenau sight the battleship Malaya that together with other cruisers escorts convoy SL-67 of 58 ships. Lütjens reports the position of the convoy to the U-boats that sink the Harmodius (5,229 GRT), Hindpool (4,897 GRT), Lahore (5,304 GRT), Tielbank (5,084 GRT) and Nardana (7,974 GRT), with a total tonnage of 28,500 GRT. In the next eight days U-105 and U-106 sink seven more ships and score a torpedo hit in Malaya that heads to New York via Trinidad for repairs. 09 March 1941: Sinks the Greek merchantmen Marathon (6,350 GRT). 11-12 March 1941: Scharnhorst and Gneisenau refuel from tankers Ermland and Uckermark. Conference held on board Gneisenau with the Captains of both battleships and the tankers. 16 March 1941: Scharnhorst and Gneisenau capture or sink the British merchantmen Simnia (6,197 GRT), San Casimiro (8,046 GRT), British Strength (7,139 GRT), Athelfoam (6,554 GRT), and the Norwegian Bianca (5,684 GRT) and Polykarb (6,405 GRT), all from a dispersed convoy. Approximate position 40° 30' North, 43° 45' West. The search continues, and later in the day, they sink the Norwegian Granli (1,577 GRT), the British Demeterton (5,200 GRT), Sardinian Prince (3,200 GRT), Silverfir (4,347 GRT), Royal Crown (4,364 GRT), Empire Industry (3,648 GRT), and Rio Dorado (4,500 tons), the French Myson (4,564 GRT), the Dutch Mangkai (8,290 GRT), and the Danish Chilean Reefer (1,739 GRT). 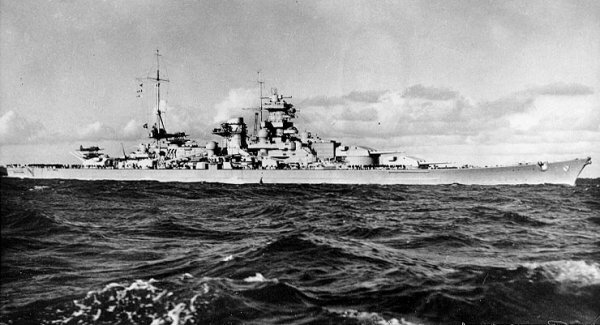 22 March 1941: Scharnhorst and Gneisenau enter Brest. March-July 1941: Develops problems with her engines and enters dry dock for repairs. 24 July 1941: Hit by five bombs while testing the machinery at La Pallice. 3,000 tons of water get on ship and the damage is considerable. 11-13 February 1942: Operation Cerberus. Leaves Brest with Gneisenau and the heavy cruiser Prinz Eugen escorted by the destroyers Paul Jakobi, Richard Beitzen, Friedrich Ihn, Hermann Schoemann, Z25, and Z29 for a dash through the English Channel. Group commanded by Vizeadmiral Otto Ciliax. Scharnhorst strikes two mines while passing through the English Channel but enters Wilhelmshaven on the 13th. March - 15 August 1942: Undergoing repairs in Kiel. 16 August 1942: Scharnhorst leaves Kiel for Gotenhafen. 09 January 1943: Operation Fronttheater. Leaves Gotenhafen bound for Norway together with the Prinz Eugen and destroyers Paul Jacobi, Friedrich Ihn, and Z24, all under the command of Admiral Otto Schniewind. Detected by British planes off Skagen on the 11th, the group returns to Gotenhafen where it arrives on the 12th. 23 January 1943: Operation Domino. Sails for Norway again with Prinz Eugen but is detected one more time by British planes and therefore returns to the Baltic. 06-09 March 1943: Operation Paderborn. In favourable weather Scharnhorst succeeds in breaking out and is finally trasferred from Germany to Narvik where she is to join the battleship Tirpitz and the heavy cruiser Lützow (ex-Deutschland). 09-23 March 1943: Anchored at Bogen Bay near Narvik. 23-24 March 1943: Operation Silesia. Tirpitz, Scharnhorst, Lützow and six destroyers are transferred from Bogen Bay to Altafjord where they run trials until July. 06 September 1943: Operation Sizilien. Together with the battleship Tirpitz, and the destroyers Z27, Z29, Z30, Z31, Z33, Erich Steinbrinck, Karl Galster, Hans Lody and Theodor Riedel, leaves Altafjord under the command of Admiral Oskar Kummetz, to attack the allied installations in the island of Spitzbergen. 08 September 1943: The group bombards Spitzbergen and destroy the port facilities. 09 September 1943: Arrives at Altafjord and anchors in Langfjord. 25 December 1943: Operation Ostfront. At 1900 hours, Scharnhorst departs Altafjord with the destroyers of the 4th Flotilla (Kapitän zur See Rolf Johannesson) Z29, Z30, Z33, Z34, and Z38 to intercept the convoy JW55B of 19 ships. The battle group is under the command of Konteradmiral Erich Bey. 26 December 1943: At 0834 hours, is detected by the heavy cruiser Norfolk from a distance of 30,000 meters (32,800 yards). Shortly afterwards the light cruisers Belfast and Sheffield of "Force I" (Vice-Admiral Burnett) also obtain contact. At 0924, the Belfast opens fire on Scharnhorst from 11,900 meters (13,000 yards), and is followed by Norfolk at 0930. Scharnhorst replies with her after turret but obtains no hits. Scharnhorst is hit by two 8-inch projectiles from Norfolk. One shell strikes the battery deck but fails to explode. The other hits the foretop and disables the radar apparatus (FuMo 27). Scharnhorst turns away southeast at 30 knots and then north again. Shortly after 1200, Scharnhorst runs once again into the cruisers of "Force I", and opens fire at about 1230 with her main and secondary batteries. In this second engagement, the Norfolk is hit twice by 28cm shells. Turret "X" is put out of action after a hit in the barbette, while another shell disables the radars and kills seven men. The Sheffield is hit by splinters. At 1241, Scharnhorst turns away south and ceases fire. At 1617, the battleship Duke of York of Force II (Admiral Fraser) obtains radar contact with Scharnhorst from 42,500 meters (46,480 yards), and after closing the range to 10,900 meters (11,920 yards) opens fire at 1648. Almost immediately the Scharnhorst is hit by a 14-inch projectile in turret "Anton" that is put out of action. Another shell from Duke of York demolishes the hangar. At 1657, Belfast and Norfolk open fire. Scharnhorst is repeatedly hit but manages to increase the distance with "force II" to 19,600 meters (21,435 yards). At 1820, a 14-inch projectile passes through Scharnhorst's upper belt and reaches the No.1 Boiler room (section IX) that becomes a total loss. The speed drops to 22 knots. At 1850, the destroyers of "Force II" close on and obtain one torpedo hit on Scharnhorst's starboard side and three more on the port side. Speed drops to 20 knots. Duke of York and Jamaica open fire again at 1901 from 9,600 meters (10,500 yards) obtaining numerous hits. Scharhorst still fires back with turrets "Bruno" and "Cäsar" but obtains no hits. At 1912, the cruisers of "force I" open fire. Thereafter cruisers Jamaica and Belfast launch all their torpedoes, and destroyers Musketeer, Opportune and Virago 19 more. The Scharnhorst finally capsizes and sinks at 1945 hours in position 72º 16' North, 28º 41' East. 36 survivors. 03 October 2000: The wreck of the Scharnhorst is found 66 miles north-northeast of North Cape. It lies some 290 meters deep, upside down and heavily damaged. The Scharnhorst before the war (up), during the Channel Dash in February 1942 (center), and in 1943 (lower). 07 January 1939 - 20 September 1939: Kapitän zur See Otto Ciliax. 21 September 1939 - 28 March 1942: Kapitän zur See Kurt Hoffmann. 29 March 1942 - 17 October 1943: Kapitän zur See Friedrich Hüffmeier. 18 October 1943 - 26 December 1943: Kapitän zur See Fritz Hintze. Displacement: standard 32,060 mt, full load 38,430 mt. Dimensions: overall length 231 m, beam 30 m, maximum draft 9.9 m, height 14.05 m.
Armour: main belt 320 mm, turrets 100-340 mm, upper deck 50 mm, armour deck 80-110 mm, conning tower 200-350 mm, torpedo bulkhead 45 mm. • 9 x 28cm SK C/34 guns in three triple turrets. • 12 x 15cm SK C/28 guns in four double and four single turrets. • 14 x 10.5cm SK C/33 guns in seven double mounts. • 16 x 3.7cm SK C/30 guns in eight double mounts. • 6 x 53.3cm torpedo tubes in two triple mounts (from 1942 on). Seaplanes: 3 x Arado ar 196. Propulsion plant: 12 boilers, three Brown-Boveri turbine sets, 160,060 hp (maximum obtained). Endurance: 7,100 nm at 19 knots. The Sinking of the German Battlecruiser Scharnhorst.